People undergoing the Lasik procedure expect not to use contact lenses or eyeglasses again in their lives. Although there is good success rate of Lasik and other refractive eye surgeries (PRK), there are some cases where the results may not be the ones expected. Lasik failures and complications do occur frequently but are commonly minor to mild side effects. However when severe Lasik side effects occur they may include partial or complete loss of vision ,along with refractive errors and visual disturbances. Most patients experiencing post Lasik complications may not be candidates for Lasik enhancements altogether. While those who do opt for enhancement surgery might not be choosing the best option available. Repeated Lasik procedure can result in more damage to the cornea. Repeat pre-Lasik evaluation: If someone had Lasik before doesn’t mean that the eyes are still good candidate for repeat Lasik. 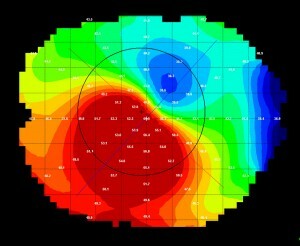 A detailed pre-Lasik evaluation has to be done again including carefully checking the thickness of cornea. Type of procedures: the type of first surgery and the remaining thickness of cornea below the flap help in deciding the type of procedure to be performed. When Lasik enhancement isn’t possible? The best option for post Lasik complication can vary from case to case therefore always consult a specialist to discuss and figure out the best option in your case. In cases where the repeat Lasik procedure for enhancement isn’t suitable option, the best option is usually using contact lenses or eyeglasses, again based on what’s best in your individual case. Gas permeable contact lenses are rigid and maintain their shape on the eye, without resting on cornea and adjusting according to its shape like soft lenses do. The space between the lens and the cornea is filled with tears that cover the irregular corneal surface. This helps in avoiding any blurring of vision due to corneal irregularity or other visual distortions. Modified GP contact lenses with larger diameter, flat center or aspheric optics can be specially designed for the post Lasik complication patients as per their individual needs. Scleral contact lenses cover the entire cornea and rest on the sclera of the eye. They are especially helpful in patients with post Lasik corneal aberrations and those having irregular astigmatism. Scleral contact lenses also help in relieving dry eyes. Hybrid contact lenses help in aberration correction while being very comfortable. They’re equally effective as gas permeable contact lenses while being easier to adapt! Special eyewear, also called “free-form” lenses, can be used to correct minor errors of refraction effectively for patients who don’t want to wear contact lenses. They are especially helpful in patients without any significant corneal aberrations. Global Complex Eye Care is specifically designed, equipped, and staffed to provide patients with nothing but the finest in professional eye care. As Post LASIK specialists, we have successfully treated patients with Keratoconus, RK, PRK, and LASIK failures and complications, cornea ectasia, Pellucid Marginal Degeneration, Stevens-Johnson Syndrome, and other irregular corneas. Optometrists and Ophthalmologists from all over Maryland and surrounding states refer patients to Dr. Irwin Azman. This entry was posted in Glare, Halos, Post LASIK, PRK, and RK Problems and tagged LASIK enhancement on February 16, 2015 by Post LASIK Doctor.